More than 10 years ago, Thorner et al. demonstrated that repeated administration of GHRH via pulsatile infusion pump (1-3 ^g/kg/pulse sc for 6 mo) increased the growth velocity of two growth hormone deficient children (Fig. 5) (27). During GHRH treatment, the growth velocity of these patients increased to rates similar to those observed during therapy with conventional doses of growth hormone. Shortly thereafter, we showed a similar effect in a group of GH-deficient children treated over two weeks with pulsatile GHRH (1 ^g/kg/pulse q 3 h iv) or placebo (28). These studies also demonstrated that prolonged treatment with pulses of GHRH continued to stimulate pulses of GH secretion (Fig. 6) and increased the circulating concentration of IGF-1. Others have subsequently confirmed these results (29,30). The finding that continuous infusions of GHRH still yielded pulsatile GH secretion indicated that it might not be necessary to provide GHRH treatment in a paraphysiologic pattern, as is necessary for a continued stimulatory response to GnRH. During the last few years numerous publications have documented that much simpler regimens of GHRH administration can also increase growth velocity in GH-deficient children. 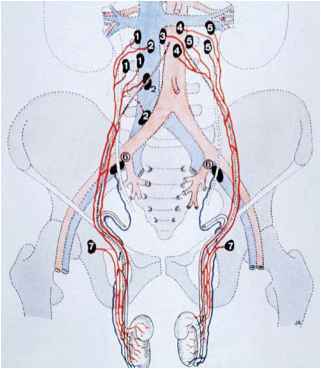 Rochiccioli et al. (31) and Ross et al. (32) demonstrated that GHRH given in doses of approx 10-20 ^g/kg/d sc once or twice daily for 6-18 mo could stimulate growth velocity to approximately twice the basal values. Similar results were observed by Duck et al. (33) and by Thorner et al. 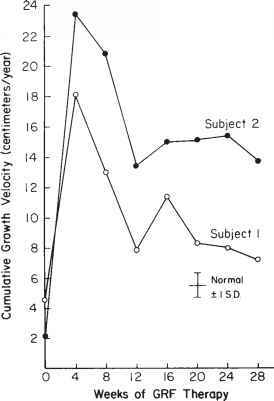 (34), who documented that growth velocity increased from approx 4 cm/yr to 8 cm/yr during once or twice daily GHRH administration in relatively large groups of GH deficient children (Fig. 7). There appears to be a correlation between the total daily dose of GHRH administered and the growth velocity effect (35); however, the optimal dose and frequency of administration of GHRH has not yet been defined (36). Fig. 5. Cumulative linear growth rate before and during 6 mo of therapy with pulsatile subcutaneous GHRH in two children with GH deficiency. The reference normal growth rate is for 8-yr-old boys. From ref. 27.
in responses reflect qualitative or merely quantitative differences in GH exposure between the two therapies. Since the supraphysiologic growth rates ("catch-up growth") seen early in GH treatment may help reduce the height lag in these children, it has been suggested that patients might be treated initially with GH and then switched to GHRH for growth maintenance. This approach has not yet been tested. In general, the chronic administration of GHRH has not produced undesirable side effects. Although a small number of patients have demonstrated apparent allergic responses to GHRH, the induction of anti-GHRH antibodies during chronic GHRH therapy has not been a clinically relevant problem and antibody titers have not correlated with these clinical reactions. The progression of bone age during chronic GHRH therapy has closely paralleled chronological age in these patients, suggesting that if GHRH therapy were to be maintained for sufficient time it might increase final height. However, no published information is available regarding final height in GH deficient children treated chronically with GHRH.